When it comes to foods that contain gluten (the protein found in foods such as wheat, rye, barley, semolina and spelt), you often think of pasta, cakes, cookies, bread and cereals. However, there are also other less obvious foods that can contain gluten or be contaminated with it that you might not have thought of. Did you know that wheat flour is often used as a thickening agent in many pre-made soups, sauces and condiments? When you buy these types of products, always be sure to double check the ingredients listed or better yet, make it yourself so you know exactly what goes into them. When you eat out at a restaurant or order a takeaway meal, ask the staff or your waiter what’s in the soups, sauces or condiments so you can avoid gluten, or simply order your food without it. 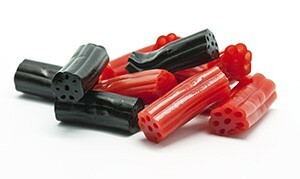 Liquorice lollies do contain wheat. There are some gluten free alternatives out there, but again it’s best to read the ingredients so you can avoid any other additives or preservatives that might have been added. Deli and luncheon meats, sausages, pre-made rissoles or meatballs and also some jerkies may also contain wheat flour. This is added as a thickening agent to provide a better texture. Ask your butcher if they can make yours without it. Stick to clean, grass-finished, free-range, organic meat and poultry where possible. Although oats are naturally gluten free, unfortunately there is a lot of cross-contamination during their processing. You can purchase certified gluten free oats, however if you still want to avoid them just to be on the safe side, we recommend to try other rolled grains such as rice flakes or quinoa flakes as a gluten free alternative. Malted barley, malt syrup, malt extract, malt flavouring, malt vinegar, barley and malt are not gluten free. They are often used as a sweetener in chocolate, lollies, ice-creams, some pre-made hot drinks, processed cookies and other processed baked goods. You will also have to look at the alcohol you consume. 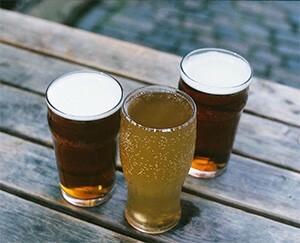 So just to be safe, try sticking to gluten free beer, gluten free cider, vodka (made from potato), tequila, rum and gin. Generally most wines are safe too, but we recommend choosing wines that are organic and preservative free. 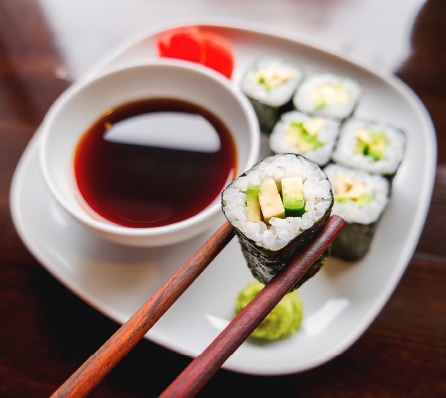 A lot of people think that getting sushi is a fantastic gluten free option, but unfortunately there can be plenty of gluten found in soy sauce. Even though soy sauce is made from fermented wheat, it still contains gluten. The best solution is to either go without, or bring your own tamari or coconut aminos which make great gluten free soy sauce alternatives. Be careful when ordering Asian food, especially ones that contain sauces. Many of the sauces are enhanced for flavour by adding soy sauce or pre-packaged sauces, which both contain gluten. If you’re a vegetarian or vegan and rely heavily on faux meat products then you may be in for a bit of a shock, as most of the pre-packaged veggie patties/burgers or other meat-free products have added wheat flour to them. Wheat flour is added as a thickener and to give it that ‘meaty’ texture. Certain kinds of flavourings that coat your favourite chips can contain wheat, barley or rye. Always be sure to read the ingredients so you know exactly what you’re putting into your body. 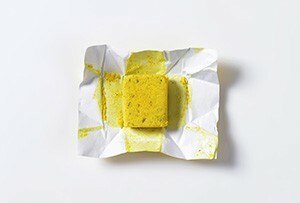 These seemingly harmless kitchen staples can be a gluten bombshell. Gluten is a key ingredient in these and can often be under other names. The most common one is maltodextrin. It’s so easy and more nutritious to make your own stock from scratch. If you need a gluten free thickening agent for gravy then use arrowroot flour instead. Breaded, crumbed, battered or floured meats and seafood are often coated in some form of wheat flour. You can purchase some gluten free bread crumbs, however there are often many other preservatives and additives in these products, so always read the label. Better still, you can always make your own. Try our Coconut chicken tenders recipe. Watch out for unexpected gluten culprits in the grocery store and let us know where else you’d never think to look for it in the comments below. Is Gluten Free flour still ok? Won’t the wheat still have still have been grown with roundup sprayed on it then the gluten removed? Would it be better to remove wheat all together? Is Rice treated the same way? Maltodextrine, maltose, dextrine/dextrose. Soy Lecithin in chocolate, ice creams, beverages, sauces. A few brands use sunflower lecithin, which, if specified, is fine. Read every label.